Open a whole new world of possibilities to your clients, while taking the burden of appointment booking and management off the hands of your staff. Imagine all the benefits your clients will receive by booking their own services. No more being put on hold or having to call within the salon's working hours. 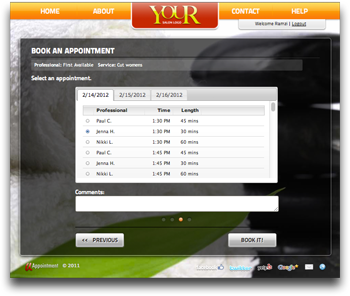 Explore the online appointment book by clicking the arrows on either side. 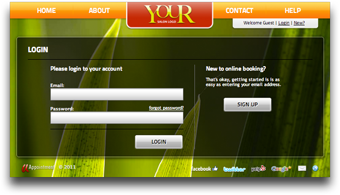 The client login screen gives clients the ability to easily and securly login to the online appoinment book to schedule appointments and access their personal information. Running promotions is a snap. 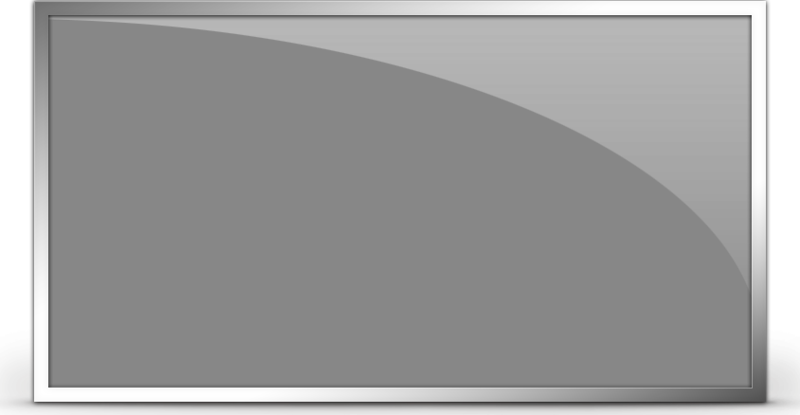 Clients are presented with any promotional banners upon booking an appointment. Promotions also appear at the top of the home screen and in confirmation emails. Clients can select their stylist of choice, or the first available stylist, and up to 3 services. 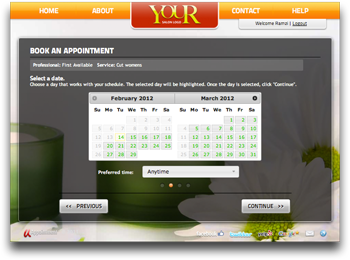 Clients select their desired date and prefered time of day to begin searching for available appointments. The client is presented with all available appointments for the selected day as well as the next 2 days that service can be performed. 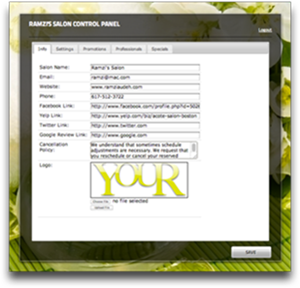 They can selected their desired appointment and enter any comments they have, which will be visible on the appointment book at the salon. 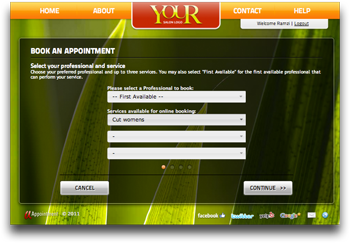 Once the client clicks the book button, the appointment is instantly booked and visible in the salon's appointment book. 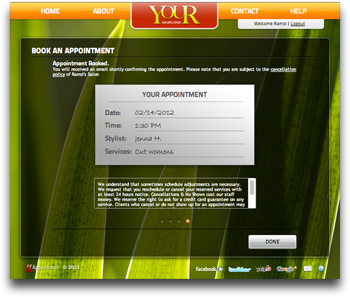 The client is presented with a confirmation screen, showing the details of the appointment they booked. 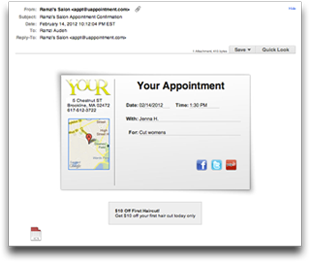 The client receives a confirmation email showing their appointment details with an appointment file, which can be used to instantly add the appointment to their calendar software on their computer and smartphone. The salon can easily administer every aspect of the appoinment booking experience, such as the booking options, setting up promotions & specials, uploading up the salon logo, and much more. Getting social has never been easier. The online appointment book will display your social media links on every page of the site as well as in your confirmations, encouraging more users to follow your pages and write reviews. 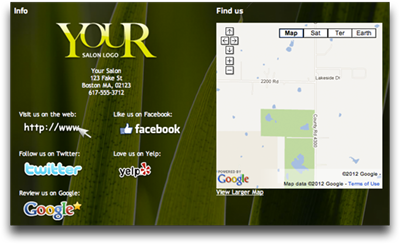 You can further customize your page by uploading your own salon logo. 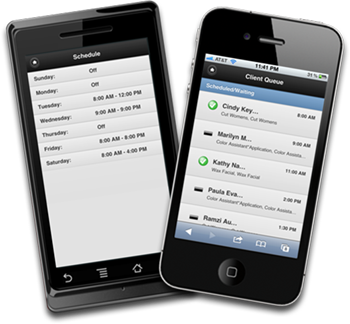 Employees can access the salon's appointment book using their smartphone. Using the online appointment book app they can book appointments, view their scheduled hours, view upcoming appointments, and view the client queue.